.Quiltscapes. : Bloomin' Blossoms for Spring! A hint of SPRING is trying to peek through the fresh snow around here! and see if we can bring a little SPRING to our table!! DRAW a diagonal line on wrong side of 1-1/2" squares of background. LAYER small squares on corners of leaves and petals as shown. PRESS. Arrows indicate direction of seam allowances. ADD Background/Leaf units to Left side of Petal units as shown. STITCH flower center to first petal, about 1"
Now it is ready to add the second petal. 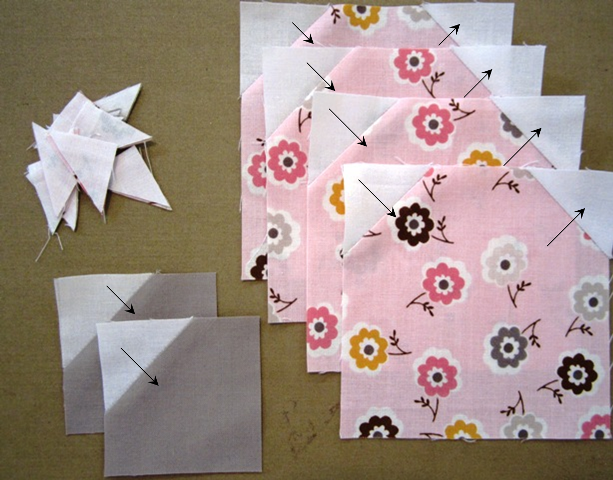 Working clockwise, STITCH each petal in the order shown. NESTLE seams at leaves. PRESS seams toward petals. Next Step: ENVELOPE the seams. 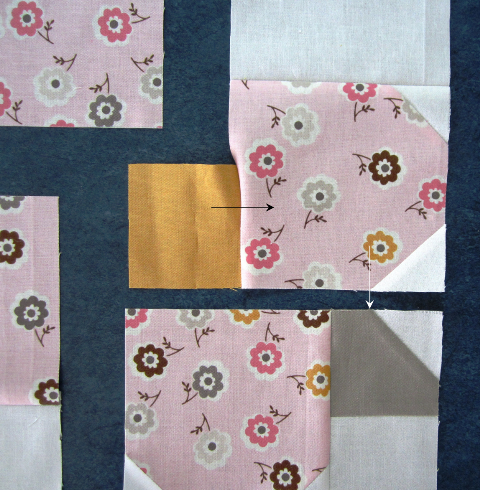 Place 18" backing square right sides together over quilt top. 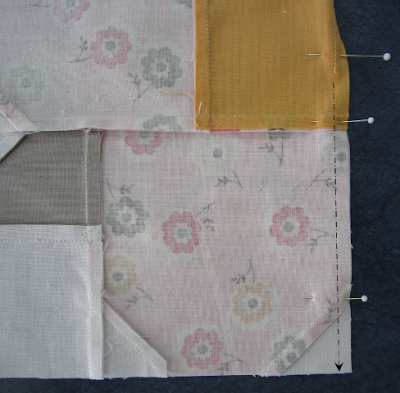 PIN, then STITCH, using 1/4" seam allowance. Leave about a 5" opening along one side for turning. Next: Place quilt, top side down over a 20" square of batting. PIN, then STITCH along the previous stitching lines through all layers. TURN inside out through opening. Ah! All Ready for SPRING! 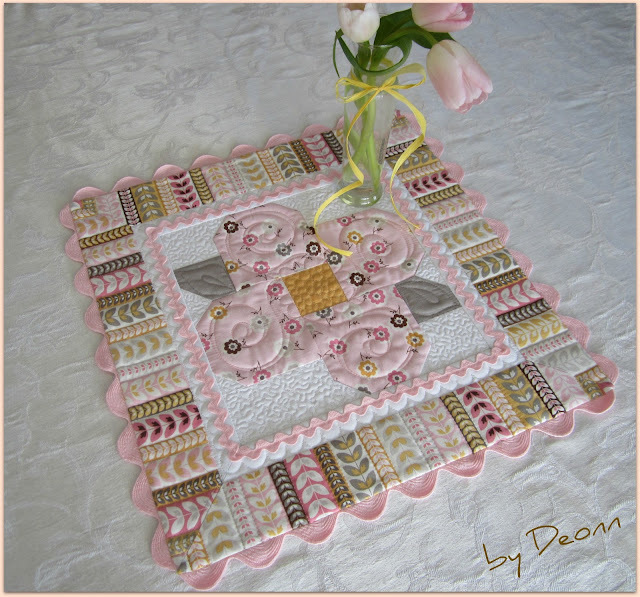 This is about the sweetest table topper pattern I've ever seen! It's light and airy, just like spring. 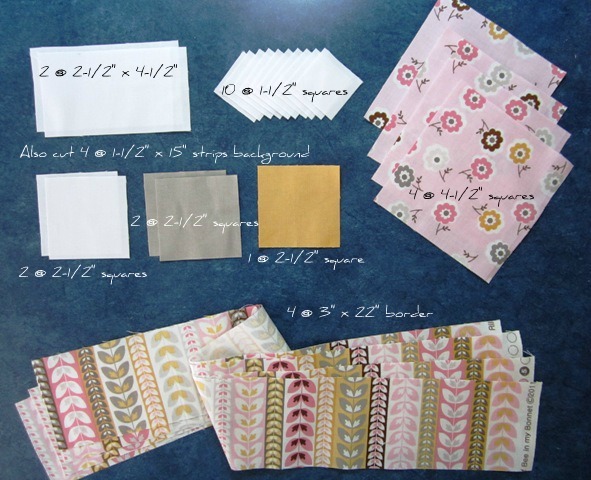 Wonderful pattern. Thank you!!! This is absolutely beautiful!! Love the colors too! Thanks for sharing! Seldom do the right colors, design, special techniques and overall beauty come together. YOU NAILED IT! Thanks for sharing! Beautifull! Thanks for sharing! Have a nice day! how sweet, going to make one tomorrow, nice weekend project!